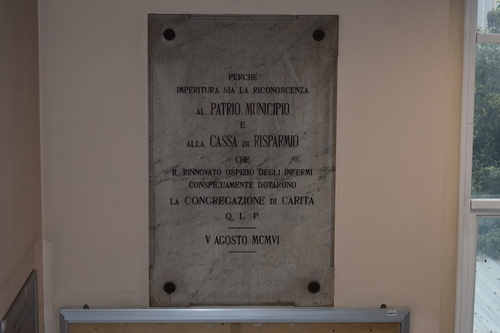 In the first half of the 1400, Pesaro was full of small structures called Hospitali, brotherhoods which had the aim to cure and help poor and ill people. Then, because of the bad economic conditions experienced by every single Hospitalum, the brotherhoods could not individually survive anymore. The Lord of Pesaro Alessandro Sforza, and the Bishop Giovanni Benedetti decided to join all the Hospitali (their name were: Nunziata, Misericordia, S. Andrea, S. Antonio, Buon Gesù): from their merger Unione del San Salvatore was born in 1465. the structure was built in "Ferruccio Mengaroni" street, where now the homonymous high school is situated. 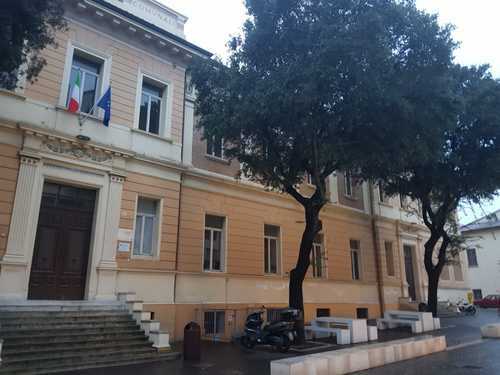 Here is the facade of "Liceo Artistico Ferruccio Mengaroni" in "Ferruccio Mengaroni" street. During the first half of the 1800 the Hospital had to take care of too many people, and it couldn't cover all the purchases requested. 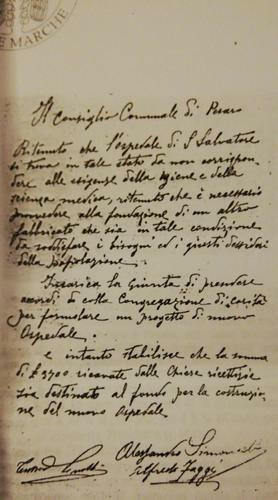 On the 28th of November 1889 the councilor Alessandro Simoncelli published a speech, regarding the necessity of building a new hospital in Pesaro: there was not the possibility to divide ill people in an appropriate way anymore; the old hospital wasn't brilliant enough to satisfy the needs of the city, because of the new therapies' levels too. This is a copy of the councilor's speech. 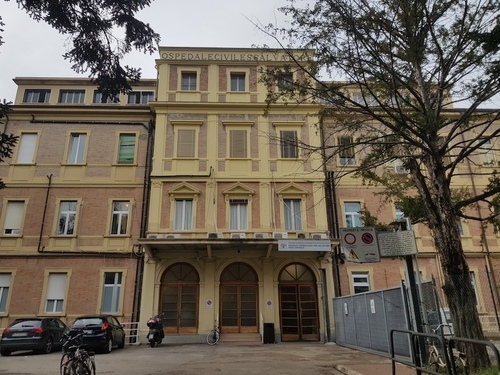 In the 1903 the activities for the realization of the new hospital in Carlo Cinelli square began, in the place of Cappuccini's monastery (whose first stone was laid in the 1656 by the Swedish Queen Cristina). On the 5th of August 1906 the new hospital was launched with the same name of before: San Salvatore. The main facade was the one that today overlooks in Piazza Garibaldi. Here's a photo that shows the principal facade of the new hospital. 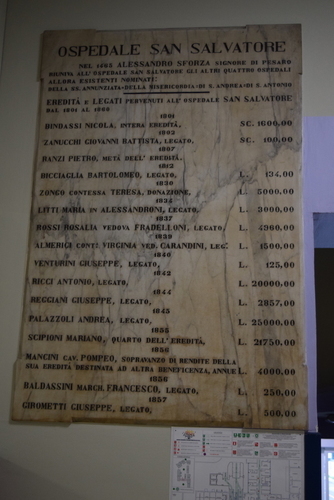 On the 4th of January 1944 Pesaro was bombed: the left wing of the Hospital was totally destroyed. 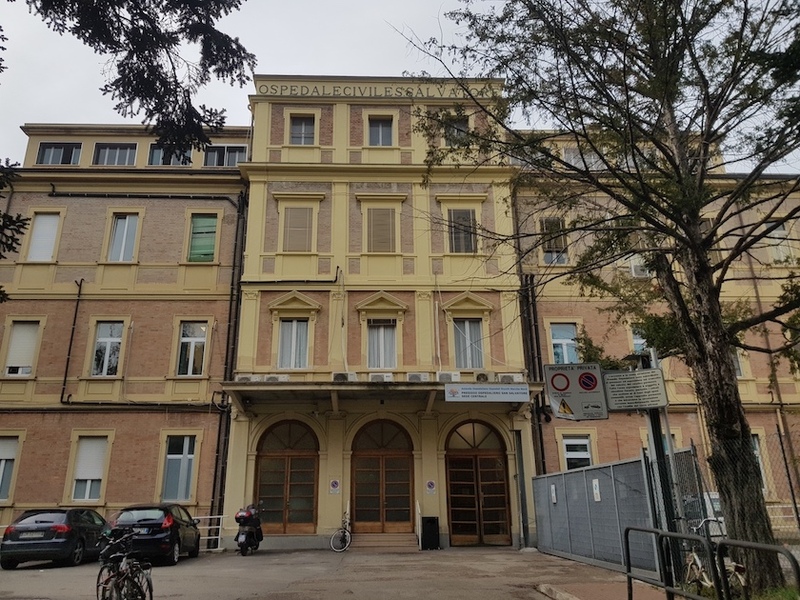 San Salvatore Hospital got out of the Second World War literally impoverished; but at the end of 40s it knew a real development thanks to the new scientific discoveries and the birth of new branch of specialization. Year after year the structure proved to be improper to host all the departments, that had been destroyed during the war: this is the reason why a new area of San Salvatore hospital was born in Muraglia, a peripheral Pesaro's district (this structure was initially thought to be the new psychiatric hospital). Today the building also hosts the service of Infectious Diseases, the radiotherapy service, and the Otorhinolaryngology clinics, in addition to the two departments previously mentioned. Here is the main entrance of San Salvatore Hospital, that today is situated in "Carlo Cinelli" square. San Salvatore Hospital has a small internal garden, through with doctors, nurses and the relatives of hospitalized people pass, in order to reach the intensive care department. This structure has to be considered one of the newest of the whole building. 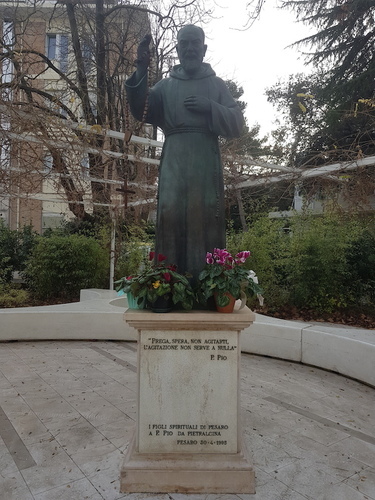 In the middle of the garden people can find a Padre Pio's statue: it was offered to the hospital by "Fratelli Spirituali di Pesaro" on the 30th of April in 1995. 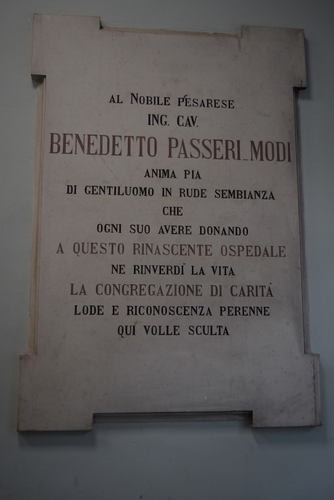 "Fratelli Spirituali di Pesaro" was the name with which people who lived together in "Casa di Spiritualità" were called; "Casa di Spiritualità" is a hospitality home today. Under the statue there's an inscription, which also reported some words pronounced by Padre Pio: "Prega, spera, non agitarti. L'agitazione non serve a nulla", which means:"Pray, hope and keep calm. Agitation is not necessary". Here is Padre Pio's statue. 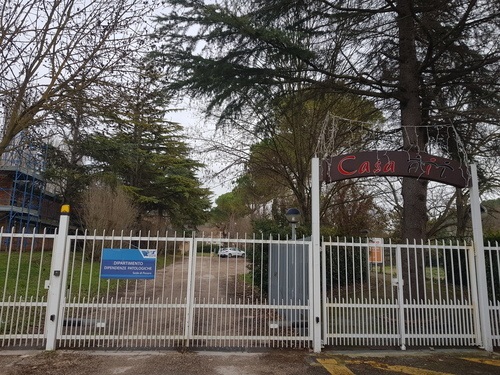 On the 1993 San Salvatore hospital was judged one of the most important hospital of Marche region: this is one of the reason why it acquired the title of "Azienda Ospedaliera - Ospedale San Salvatore". 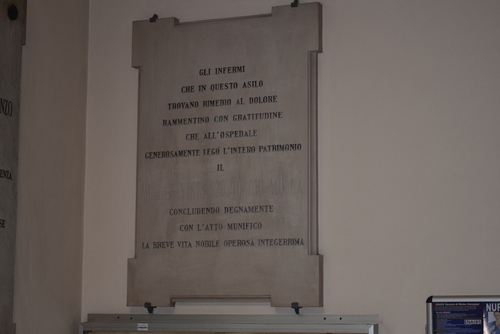 The hospital has been recently modernized: anything of the past hasn't remained into it, instead of many commemorative plaque; one of them wants to remember the benefactors of the hospital. 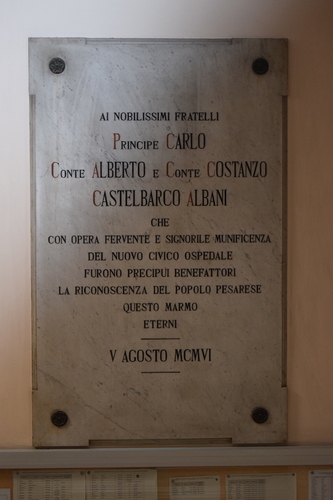 These last four commemorative plaque are situated in the central staircase of San Salvatore Hospital: they remember the names of citizens and institutions that mostly contributed to the building of the new hospital. Photo and main text by Alberta Mauro and Cecilia Tempesta. 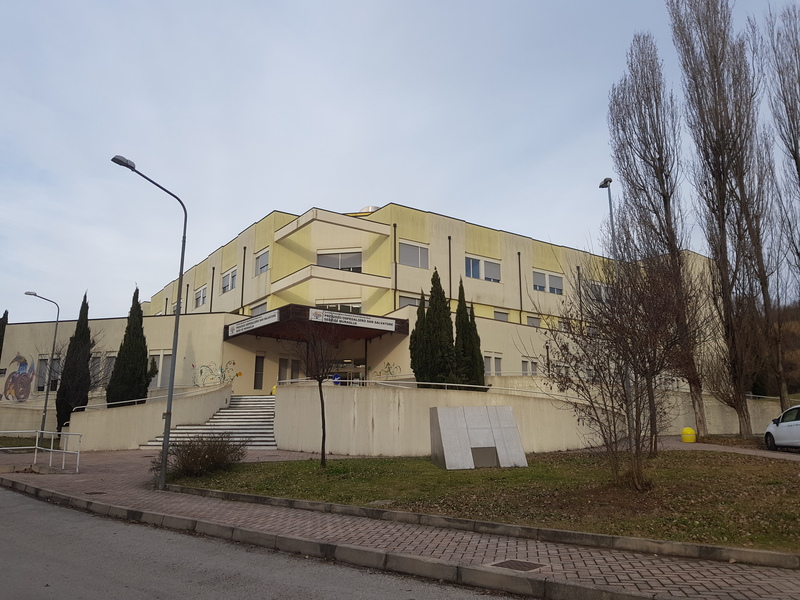 Pesaro e il suo ospedale, a cura di Luigi Maria Bianchini e Massimo Gunelli, comune di Pesaro, provincia di Pesaro e Urbino. Cenni storici dell'ospedale San Salvatore, D. Ceccherelli, Biblioteca Oliveriana, Pesaro. 1. Next to Muraglia's hospital there's "Casa Ail", inaugurated in 2009. It's a kind of village, with the aim to better poor and ill people's life conditions: particularly, who has hematological diseases can live there for free, in order to avoid a prolonged permanence into the hospital.